I was trying to think of something really easy to throw together for dinner and I was really in the mood for a cheesy, hearty comfort food casserole – this Cheesy Buffalo Chicken Potato Bake turned out to be just the thing! I started with my recipe for Cheesy Potluck Potatoes and decided to turn it into a main dish by adding chicken and giving it a Buffalo flavored twist. It turned out awesome, it’s so simple to make and it’s also a great way to use up leftover chicken. 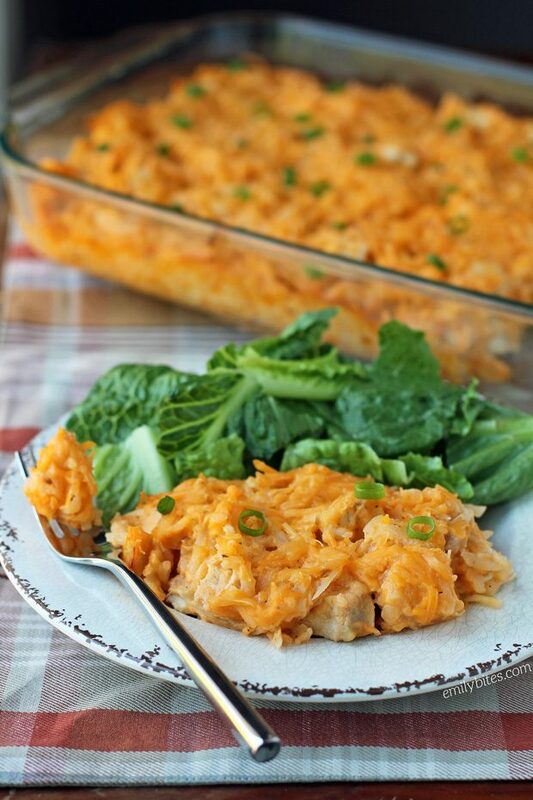 I suggest pairing this Cheesy Buffalo Chicken Potato Bake with a salad or some roasted vegetables for a tasty, complete meal. Each creamy, cheesy serving of the casserole is only 302 calories or 6 Weight Watchers SmartPoints – you’ll never believe it when you try it. Don’t forget to check out my Easy Slow Cooker Shredded Chicken post- the perfect way to make shredded chicken for this recipe! 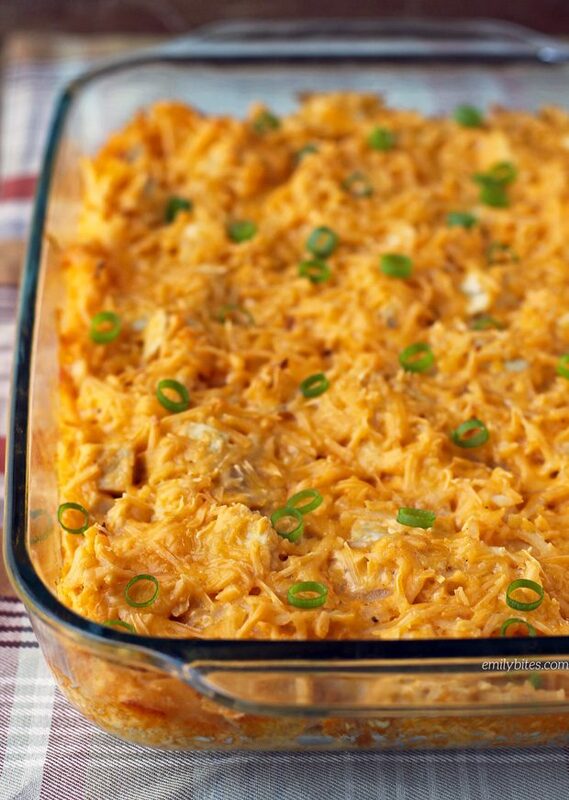 Looking for more ways to incorporate that Buffalo chicken flavor into your meal plan? Check out my recipes for Buffalo Chicken Soup, Buffalo Chicken Pasta Salad, Buffalo Chicken Taquitos, Buffalo Chicken Lasagna Roll-Ups, Buffalo Chicken Quinoa Bake, Buffalo Chicken Enchiladas, Buffalo Cheese Bread, Slow Cooker Buffalo Chicken, Buffalo Chicken Mac and Cheese Muffins, Buffalo Wing Hummus, Buffalo Chicken Pizza and many more in the Buffalo Flavor section of my recipe index! Place the shredded potatoes in a large mixing bowl and drizzle with the melted butter and black pepper. Stir together and then add the diced or shredded chicken. Add the sour cream, cream of chicken soup and wing sauce and stir together until well combined. Mix the full fat and reduced fat cheddar together and add 4 ounces of it into the bowl with the chicken and potatoes. Stir until thoroughly mixed. Transfer the chicken and potato mixture to the prepared baking dish and spread it evenly across the dish. Sprinkle the remaining 2 ounces of cheddar over the top of the other ingredients in the dish and place into the pre-heated oven. Bake for 45-60 minutes until the potatoes are cooked through and the edges are golden. Remove from heat and sprinkle with scallions if desired. Slice into 8 pieces and serve. Can’t wait to try this, as it looks totally delicious. I’ll be using 6 oz of sharp cheddar when I make it, and take the point hit. I agree it has more flavor and better texture. How spicy is this? Mild, medium or hot? Thanks! Mild. It has Buffalo flavor but isn’t too spicy. You can amp up the heat with more wing sauce if you prefer! What is the point difference if you used 6 oz of sharp cheddar cheese. We had this tonight… LOVED it! 7SP… tastes like 20! There’s just the two of us, so we have leftovers! I’m one happy girl! Made this tonight! It was a HUGE hit with the family! Definitely a keeper! Oh my goodness! Just finished this for dinner and I can’t believe how good it is! Definitely a keeper! The serving size is 1/8th of the casserole. Enjoy! I made this today for my lunches this week at work for my hubby and I. I taste tested prior to portioning it for the week, tasty! Thanks for another great recipe. Made this last night!! I substituted half of the potatoes with a head of chopped up cauliflower for an even healthier option. Needless to say, there were no leftovers today. Family LOVED it. Hi, did you cook the cauliflower before or just throw it in uncooked? Can you used frozen shredded potatoes? Emily- Just wondering if you could use the bag of diced potatoes instead of shredded. We tried it with the shredded potatoes first but my husband didn’t really like it with shredded potatoes so I am thinking about subbing hem for the diced. What are your thoughts. Other than that myself and my 3 kids love it just the way it is!! Do you think i can mix it all tonight, keep in fridge and bake tomorrow?? Love this recipe! Made it tonight only had no hash browns and lots of left over spaghetti squash. Chopped up the squash and it looked just like the shredded potatoes. Also added some chopped celery for a little crunch. Thanks for such a great recipe! I can think of dozens of variations and that makes it a real keeper! I did the same as Jill above. I substituted half of the potatoes for shredded cauliflower. Mine was an accident because I thought I had more potatoes!! It turned out great. I calculated this recipe in my Weight Watchers app on the recipe builder and it says 1 serving is 10 smart points. Still not too bad for a main course. Thanks for the recipe! Can’t wait to try it for dinner! Can you use frozen hashbrowns? This is so, so SO delicious! I love anything buffalo chicken and this is now one of my favorite meals to cook. 2 times in 2 weeks now! Another winner!!!! Your recipes are awesome! Thank you, thank you, thank you!!!! Great recipe! I used 5oz of full fat cheddar instead of the mix and used plain, fat free Greek yogurt in place of sour cream. I divided it up into 5 large portions for 9 points. Delicious and super creamy! Hi! Can you freeze this before baking? What is the serving size I know you said 1/8 th of the casserole but what does that equal to like 1 Cup etc…….. The flavor was good but seemed a little dry to me. Any suggestions? I Resisted the urge to add Bleu Cheese dressing because I didn’t want the added points.